If like me, you love a little mid-century style in your home interiors I thought you might like this little moodboard of images I’ve put together of some of my favourite finds for some fabulous mid century retro inspiration. Taking it from the top down sofas like this are very easy to find at the moment and this Paddington 3 Seater from Fashion for Home is stunning. I love the clean lines and hard edges, inspired by the 1950s it has a classic Danish feel. The sideboard again from Fashion for Home takes inspiration from Denmark but updates it in a very modern way. The gorgeous Organic green chair is from Lakeland-Furniture, a company that specialise in high-end reproductions of famous designs of all the modern classics and would be great as an occasional chair or it could be used in an office. 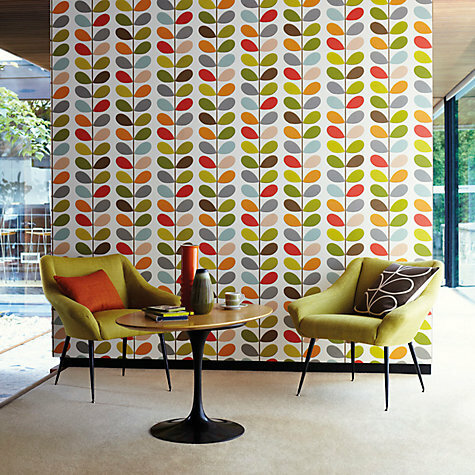 Orla Kiely has to be one of my favourites of the moment. Her iconic designs transcends time and looks stunning in modern interiors. Maybe it’s a little Marmite for you, and you either love it or hate it – I’m certainly loving it for now. The wallpaper is from a range for Harlequin and retails at £59 per roll. I had to add in an Orla Kiely mug – I have a bit of a passion for mugs unfortunately (remember these from a little while back?) and so Orla Kiely and a mug all combined is like heaven for me. The Max and Moritz coffee table set again from Fashion for Home combines two coffee tables that interlock to create a unique design, that’s unmistakably retro. And finally another cushion from Habitat, one of my all time favourite places to shop for home interiors. So what do you make of the mid-century look? Is it one that inspires you? Would you incorporate it into your own home?